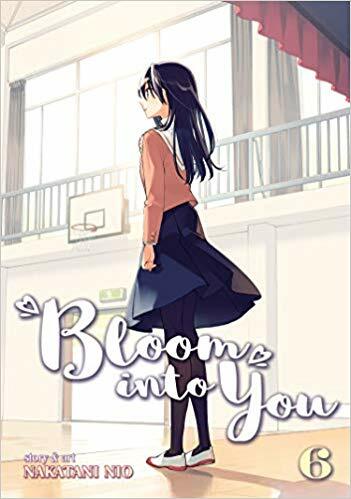 I've had mixed feelings all along about Bloom Into You. Surprisingly, the anime actually helped me like the manga better. So I've been eagerly awaiting Volume 6 which takes us beyond where the anime leaves off. Sadly, this volume is mostly god awful filler before finally getting to a meaningful moment. Quick summary: Nanami Touko is the 2nd year head of the student council. Koito Yuu is a first year helping out with the council. Yuu has spent her life not understanding love and not particularly caring about it. She has a wonderfully sweet but slightly gender-non-conforming style, and is somewhere between asexual or aromantic (not exactly sure about this yet). This is a needed character in manga. Out of nowhere, Touko confesses to Yuu, knowing that Yuu cannot reciprocate. However, Yuu is drawn to protecting Touko and pledges to stay by her side. As the months unfold, Touko and Yuu develop some light physical intimacy to go along with their budding emotional relationship. But Touko is struggling with the legacy of her deceased older sister and escaping her shadow (self imposed as it is) and Yuu is suddenly having feelings and sensations she's never had before. This leads into the production of a student council play at the school festival, written by a friend, something Touko is determined to do to carry on her sister's wish for the student council to produce a play. Volume 6 picks up with the play itself, a thinly veiled exploration of Touko's inability to be herself and living as if she is a replacement for her sister (something no one asked her to do). Sadly, the majority of this volume is the play itself, which is so poorly written (in typical highschool fashion) as to be nearly unreadable. It is absolutely accurate for how a highschooler would write, but that doesn't make it good entertainment in a manga. We've also had so much of this play in snippets of rehearsal that this volume seems wasted rehashing it. What matters most is the new ending that Yuu helped to write and forces Touko's character to reconcile many parts of her personality into an integrated whole, something that Yuu wants for the real Touko. So after several chapters of slogging through a poorly written school play that is a such a clearly forced metaphor for Touko, we actually get to some plot between Touko and Yuu. And that part I won't share, because it would be too big a spoiler. But there is a misunderstanding that is going to set up some much needed conflict that will hopefully give the next volume some weight that this one was missing. My hope is that as this new conflict is resolved, we will perhaps find Touko and Yuu moving into another phase, one that (if handled thoughtfully) will allow the author to explore Yuu's asexuality or aromanticism (not sure exactly as she seems to struggle to connect romantically but likes the kissing, but it's not yet clear) in a new context, the context of an actual relationship. We need mirrors for those in the asexual/aromantic community, we need portrayals in the media, and we need them to be honest explorations of the differences between romance and sexuality. I hope that volume 6 portends to that possibility in the future of the series. On its own though, this volume was pretty lame and disappointing. I'm giving it a 5.5/10 because it was a slog, and didn't do much until the end. It might be needed for the series in the long-run, but it doesn't hold up on its own and I think some of the boring stuff could have been shortened. However, I'm eager to see where the series goes from here having set up a new and important conflict between Yuu and Touko.